Sorry I'm a bit late on this but everyone looks like they're having so much fun I had to chime in. Better late than never, right...? I hope so. Anyways, thanks again for inviting me into your talented fold! This is my cartoony version of a character that I enjoyed on television and because of Alex Toth's iconic illustrated tales. I really enjoyed both for different reasons! One as a child and the other as an envious artist! Too cool, Dan! So much attitude in one face. Better late than never, and love the tones. I love it, dude! I'm glad you got to chime in. I've been eager to see what you had up your sleeve for us! Hope you get to do a TORPEDO piece this week! You're a natural fit for that kind of material. I wonder if Clint would've made a good Zorro? That's gorgeous man. I really like how you use big, chunky lines and the open-line background is lovely. This is the golden example of "...but not least." Totally killer, Dan. Again, everytime I see an illo by a fellow TWARTist I just want there to be a full book associated with it! Nice work as always Dan. 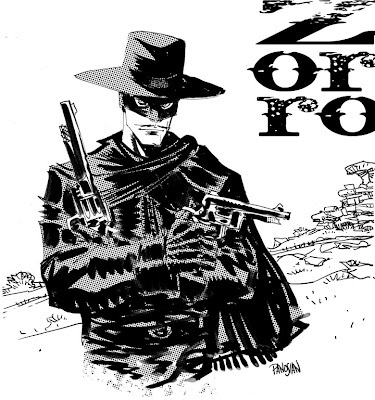 Kickass attitude in this, which is perfect for El Zorro! Whoa! I would have missed this had I not been paging back through all the great additions. Well done, Dan. How did I miss this one? It's awesome! I love the open lines of the background. Cool! Superior work, Dan - lovely, lively brushwork. Pure badassery! Thank you so much! It is an incredible online site.